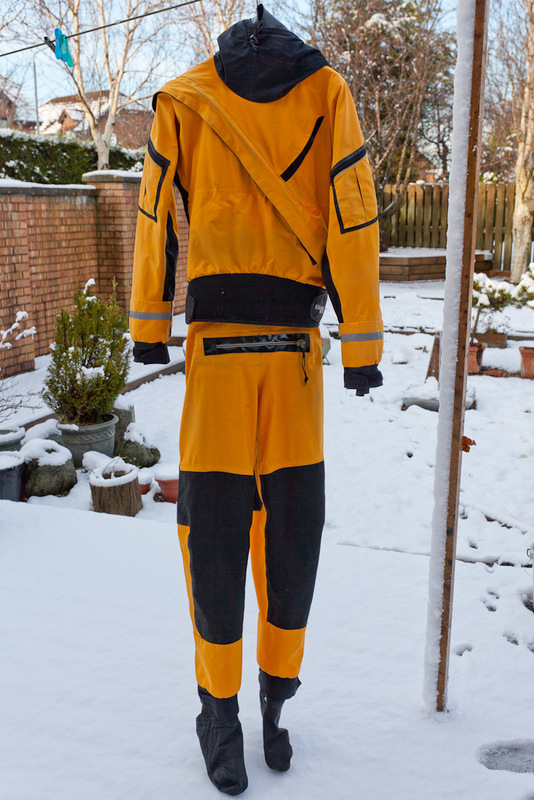 Kokatat GORE-TEX® Expedition Dry Suit, extended long term test and review. 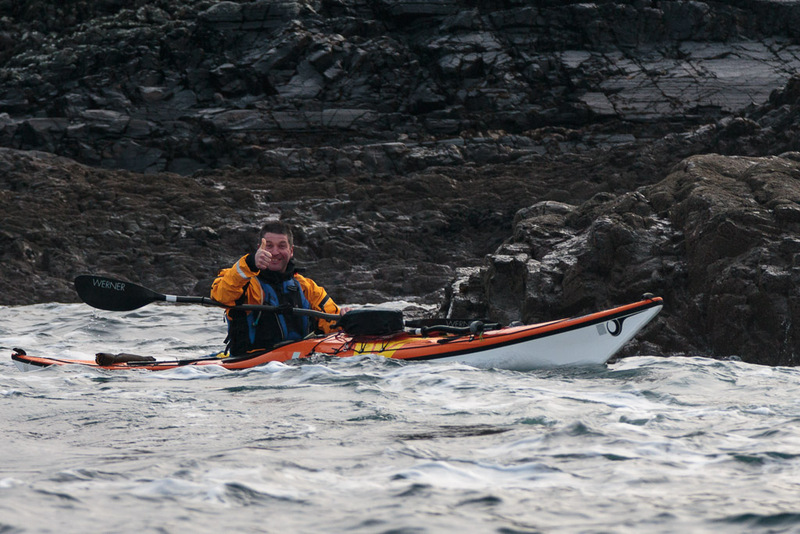 My Kokatat GORE-TEX® Expedition Dry Suit is probably my most used bit of kayaking kit. In the West of Scotland I use it from October until June. 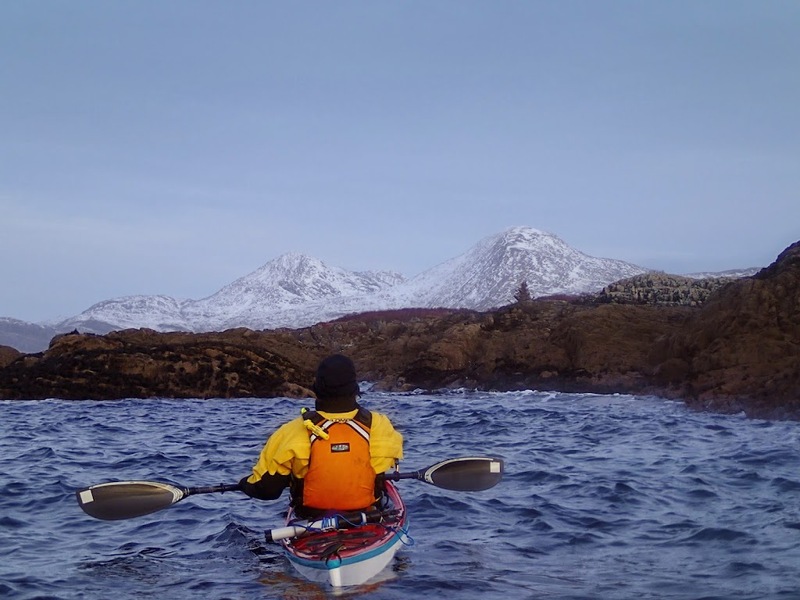 I bought from Sea Kayak Oban in October 2008 so it is six and a half years old. Though since I was disabled for several months last winter, it has seen just over 6 years use. I bought it after owning three other dry suits which proved not breathable enough, too stiff to paddle in comfortably or leaked (or all three!). In a blog in December 2011 I did a 3+ year review and since I still use it I thought it was time for an update. I also did a long term review for the last issue of Ocean Paddler magazine (#45) but given publishing schedules, that was actually written some time ago. Since then I have returned the suit to System X for a service with interesting results and I now include those findings here. The Kokatat Expedition has a front entry zip metal toothed zip which runs from right shoulder across and down to the left hip. I initially found it a bit awkward to start at the right shoulder but I soon got the hang of that. A friend bought a medium and found he could not do the zip himself and after several seasons gave it to his daughter and bought a large. He now has no trouble operating the zip himself, so this is something to bear in mind when choosing a size. The male relief zip is worth every penny spent on it. There is also a female drop seat version. There are handy zipped pockets on either shoulder with a security loop inside each. These pockets will hold a small Aquapac and I keep my car remote key in one and a small mobile phone in the other. There is another small pocket high on the left chest. There is a spray skirt tunnel that I never bother to use when sea kayaking. The gaskets are protected from UV by being covered by cuffs at the wrists and neck. There is a GORE-TEX PacLite hood which is very well articulated so you can turn round without losing vision. I don't use it often as I usually use a Lowe-Alpine Mountain cap in cold weather but it is really good in heavy rain or hail, even on top of the alpine cap! 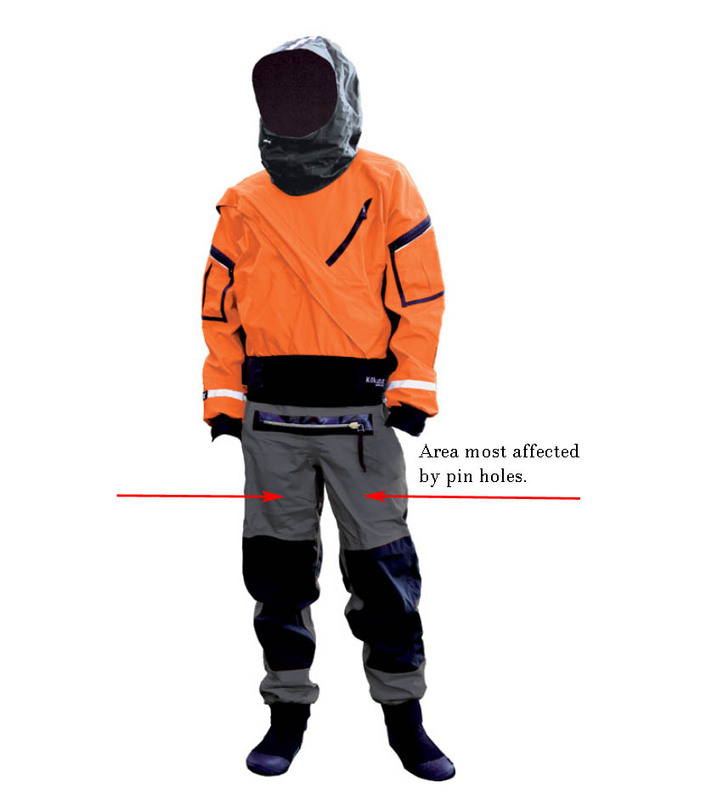 If the hood is rolled and secured by its velcro strap it does not get in the way of rolling (but I would not use a suit like this in a grade 3+ WW river environment). If the hood is unsecured it does not particularly impede a lay back roll but it does fill with water and make forward finishing rolls difficult. The socks are also GORE-TEX and I get changed on a foam mat to avoid puncturing them on sharp grit underfoot. I use Lomo Aquaboots with this dry suit as they have a gusset behind the zip which prevents sharp sand sand and fine grit (which might puncture the socks) from entering the boot. The body of the suit is made of GORE-TEX reinforced in places such as the seat, knees etc. with cordura. The GORE-TEX material is thinner, softer and much more flexible than breathable laminate materials I have used in other suits. It's even available in a choice of colours. You can have mango like mine or radish! A real feature of this suit is that it is not made in China in a factory powered by coal, it is made in the USA in an environmentally sound factory. I rinse the suit, inside and outside, with fresh water after every use making sure I give the latex a good wipe then peg it upside down to drip dry in the shade. After about an hour I hang it up the right way in a well ventilated garage. I find that the suit is so breathable that I do not need to turn it inside out to let the inside dry like my other "breatheable" suits. About every 5 to 10 uses I cold machine wash the suit using Nikwax Tech Wash followed by Nikwax TX direct wash in proofer. I give the suit a cool iron (with a cotton cloth between the suit and the iron) to reactivate the water resistant finish. I then wipe the latex seals with 303 Aerospace protectant, as recommended by Kokatat. I keep the zip well lubed with zip lubricant. The only fault this suit has developed is that the stitching on the little security loops in the shoulder pockets has become undone. The first loop parted company after 6 months, the second after four years. The only apparent wear points on the suit are two small abraded areas on the inside of the upper arms where the suit has been rubbing on my Kokatat MSFit Tour BA (I know this is the female version of the OutFit Tour but the latter has the radio pocket in the middle and I don't like the aerial up my nose). The latex gaskets lasted 5 years before they began to show first signs of perishing. The rubber became sticky and stuck to itself especially at rolled edges. At 5.5 years old, I had the seals replaced by "The Rubberman". I sent him the suit on Tuesday and got it back on the Friday of the same week. He also pressure tested the suit and found only one small leak under one of the abraded areas on the inner arm. He fixed this with a small rubber patch on the inside.) The suit has faded a little but not as quickly as some of my other items of sea kayak clothing or my other dry suits. At six and a half years old my suit was still bone dry in normal paddling but I did notice that if I waded into the water to take photos there was some localised dampness on the front of my thighs although my bum and feet remained dry. I returned my suit to System X for pressure testing. System X found approximately 75 pin hole leaks most of which were clustered on the front of the thighs. 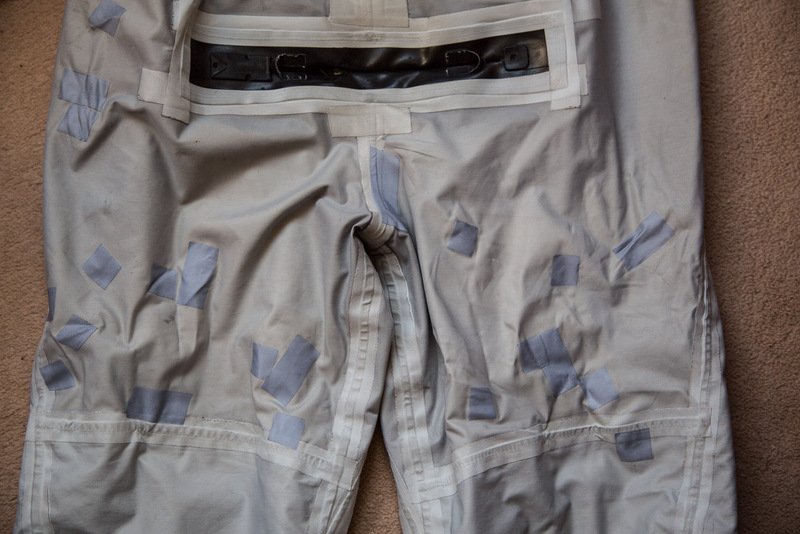 Each leak is repaired with GORE-TEX approved patching material. They even removed and replaced the rubber patch which the Rubberman had used the year before. I suspect that The Rubberman had only repaired the largest leak and missed many of these smaller pinholes. System X charge £40 for pressure testing a suit, up to 100 patches and that even includes postage back to you! I think that it is remarkable that a six and a half year old dry suit can be made completely waterproof again. It is a lot cheaper than buying a new suit! I fully expect to write an even longer term review of this suit in another three years and who knows after that...?. The only thing that System X could not do was replace the two missing security loops in the arm pockets of the dry suit. It is interesting to see where the majority of pin hole leaks occurred on this 2008 dry suit and also my 2005 Whirlpool bib, which I had serviced at the same time. In both garments, they were clustered on the front of the upper thighs, above the area of cordura reinforcement at the knee. The pinholes have occurred in the area where the suit is in contact with the thigh braces in my kayaks: Cetus MV, Aries 155, Delphin 155, Quest LV, Nordkapp LV and Rockpool Alaw Bach. Perhaps Kokatat should consider extending the cordura further up the thigh? On (and in!) the water. 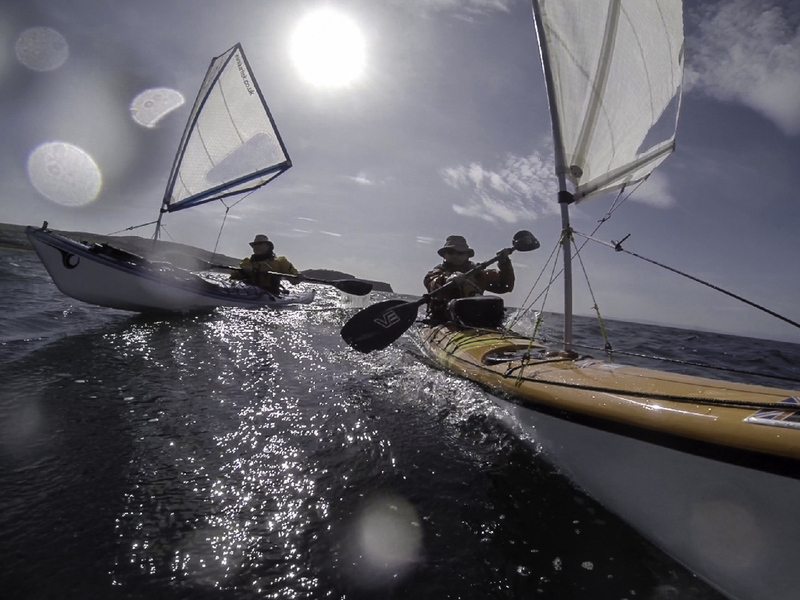 The GORE-TEX material of the Kokatat suit is the most breathable I have worn on the water. This means that I can use it in warmer air conditions than friends who have non GORE-TEX suits. In fact, I even use it in rough conditions in the Scottish early summer, when the water temperature is still cold. 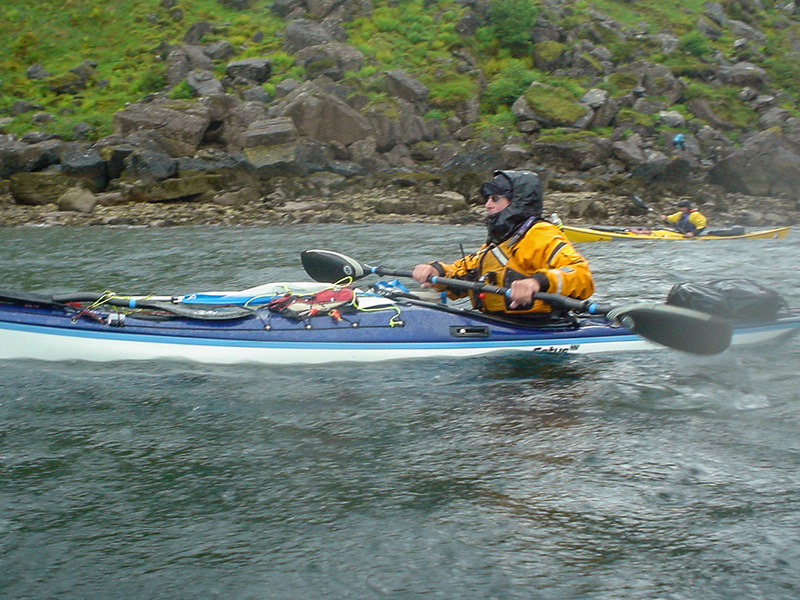 In June 2011 we went for an evening paddle along the SW coast of Dun in the remote St Kilda archipelago. I wore the Kokatat, a friend wore a two piece and swam after a rogue swell broke over a reef. The water temperature was 9C and the resulting hypothermia drew that trip to an end. Interestingly, the paddler did have a dry suit on board the mother ship, a heavy non breathable suit, but did not wear it because it was too hot! In the west of Scotland the sea temperature does not get much above 10-11C until the end of June...after the longest day!!! Falling into water that cold can kill so having a dry suit that you can continue to wear later in the season is a great safety benefit. Last year I accidental capsized on the way back from Ailsa Craig (which lies 14 kilometres offshore). It was the 21st of April, a lovely sunny spring day. On land the air temperature was 20C but the water temperature was only 7C. It was my first long paddle after my knee operation and my knee was agony. I put my paddle down and used my hands on the cockpit rim to lift my bum off the seat to stretch my leg out. A rogue wave came along and with my high centre of gravity... sploosh I was in! As I could not find the paddle I could not roll (and did I say I had the sail up?) Anyway a quick assisted recovery and I was on my way as if nothing had happened. That is what dressing for immersion means. A week earlier on another sunny day with water temperature of 7C (but with a F4 wind) Mike and I met an "experienced" solo paddler wearing only a T shirt ( he was probably a member of the Darwin Kayaking Cub). We of course were wearing our Kokatat Expedition suits. Paddling in winter a dry suit might keep you dry but it won't keep you warm on its own. You need to wear thermal insulation underneath. I use combinations of Kokatat merino and Fourth Element fleece of various thicknesses depending on the season. Even after energetic paddling this combination of fleece and GORE-TEX means that the fleece and socks never get wet with sweat. At the end of a session I can remove the suit and pack away my kayak and stuff just wearing the near dry fleece. I tend to use plain cotton boxer shorts under the fleece layers. At the end of a long day's paddle these are still dry. I could not use cotton shorts under the fleece in a non GORE-TEX suit as they would become soaked in sweat. The cut of the Kokatat suit is so unrestrictive that I hardly notice I am wearing it, even when paddling hard. After practising rescues, my Kokatat is still bone dry. Because I have two very painful and unstable knee joints, which limit my mobility, I like having the added security of a dry suit. It might take me a bit longer to rescue/self rescue if I fluff a roll. Falling in to cold water is a real danger while sea kayaking and wearing a dry suit is a great backup if things go wrong. 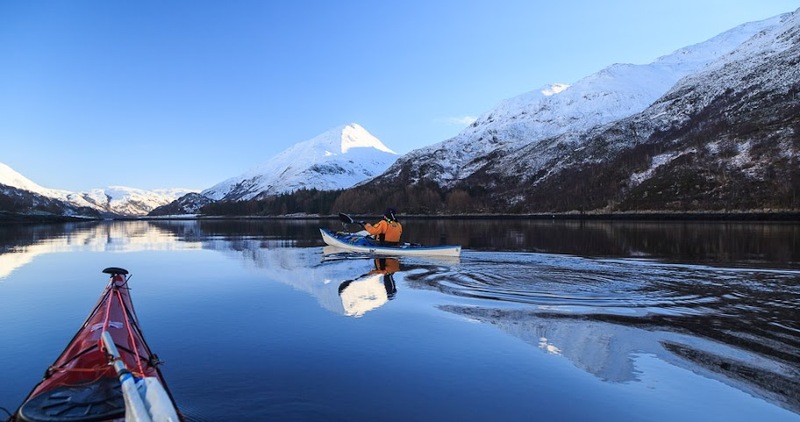 In January this year we enjoyed a four day winter sea kayaking trip to Loch Leven, a sea loch that bites deep into the highest mountains in Scotland. In winter, the sun never rises above the mountains at the head of the loch. 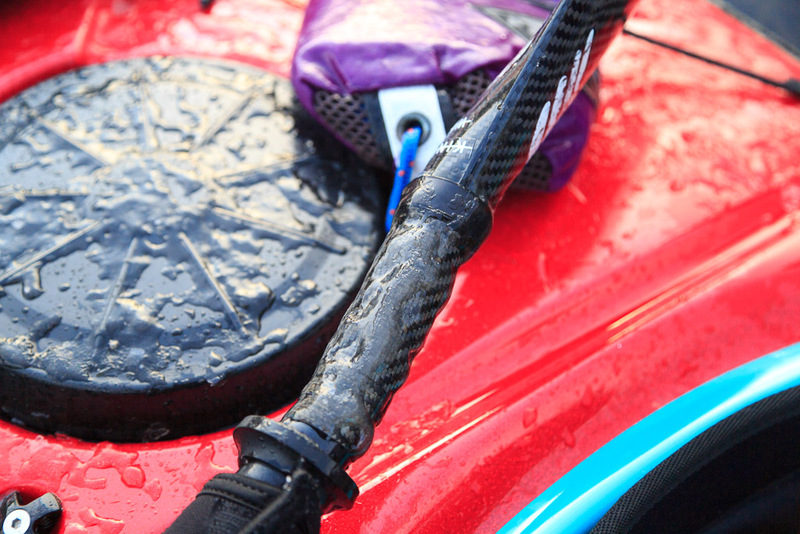 In the mornings the temperature was minus 12C and sea water was freezing to our paddle shafts. Despite the extreme cold, the Kokatat material remained flexible. 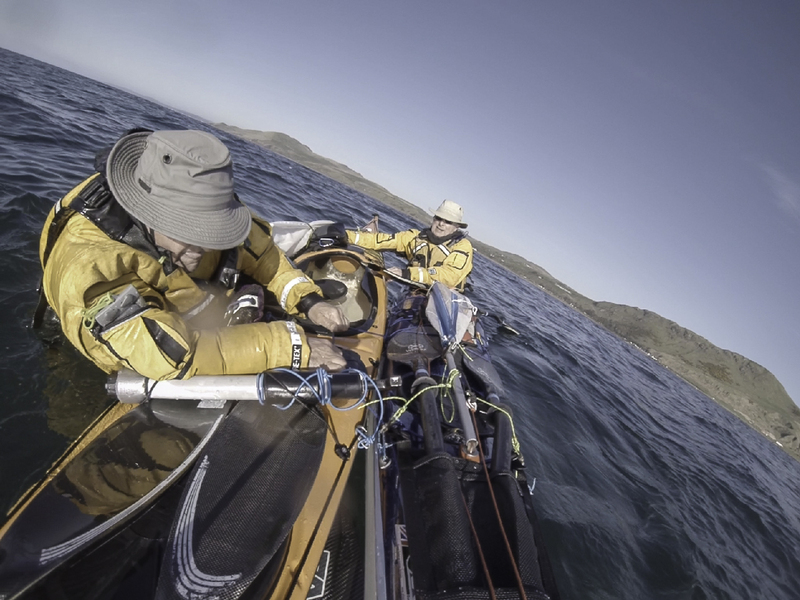 Mike and I remained warm and dry in our Kokatat Expedition suits. Ian's non GORE-TEX suit was noticeably stiff and cumbersome in comparison and he was very cold. He had especially cold, wet feet caused by perspiration (not leaks as his suit was watertight if not breathable). Ian ordered a new Kokatat Expedition on his return and as you can see, he is delighted with it. On my most recent winter day on the water I was able to make a very useful comparison between the Kokatat and a popular competitor’s ‘breathable’ suit. I forgot my Kokatat drysuit but fortunately Ian still had his old suit in his car and lent it to me. I wore the same undersuit I usually do and although Ian's suit was not leaking, my undersuit and socks ended up wet with sweat and I felt very uncomfortable and cold, especially when we stopped. My feet were frozen. Unlike Ian who had never been more comfortable! The borrowed suit was noticeably more restrictive than the Kokatat suit and I found it difficult reaching forward to my camera bag. Also, I could not plant my paddle blade as far forward as I usually do. I ended up with rashes under both arms. The suit I borrowed is very affordable but for serious winter paddling it just could not compete with the Kokatat for freedom of movement and comfort. 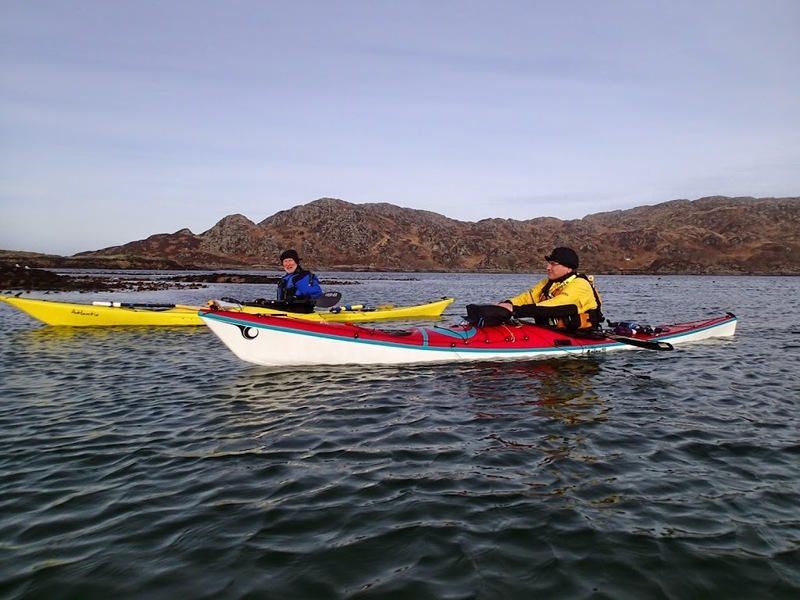 The Kokatat Expedition (currently £1,000) costs an arm and a leg but I think it has been one of the best sea kayaking purchases I have ever made. It represents true value for money and when it eventually wears out, which I do not think will be soon, I will replace it with another. That would hopefully last long enough to see me out! Two of my previous brands/models of drysuit currently cost in the order of £600. Both required replacement of panels within the the first twelve month guarantee period due to delamination. Each lasted three years until they became unusable due to extensive leaks caused by further delamination of the material at the seams. Both proved uneconomic to repair. I fully expect that my serviced six and a half year old Kokatat suit will last at least another 3 years for a current cost of £1000 + £40. I will let you do the sums and decide for yourself which represents better value for money. But it's not just about cost, the Kokatat's performance and comfort is noticeably superior to cheaper suits. The Kokatat Expedition dry suit is an unparalleled blend of freedom of movement, comfort, breatheability, dryness, durability and long term value for money. Score 12/10. It would have been 13/10 but for the security loops in the pockets coming undone!